About 10 years ago when I was in Beijing, I checked out an exhibition that was a replica of the Mogao Grottoes in Dunhuang. I didn't know anything about them but it sounded fascinating and was so glad I went. Afterwards I was thinking, I have to see the real thing... wherever Dunhuang is! It took me a decade to finally go see the place in person and it has to be appreciated on so many levels in terms of art, history, and society. It all started in 366AD, when a Buddhist monk named Le Zun was traveling in the area and had a vision of a thousand Buddhas. He built a cave here in hopes of reaching nirvana. 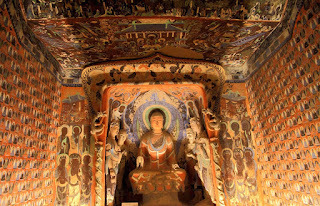 Others soon followed, digging out their own caves and began decorating them with paintings. 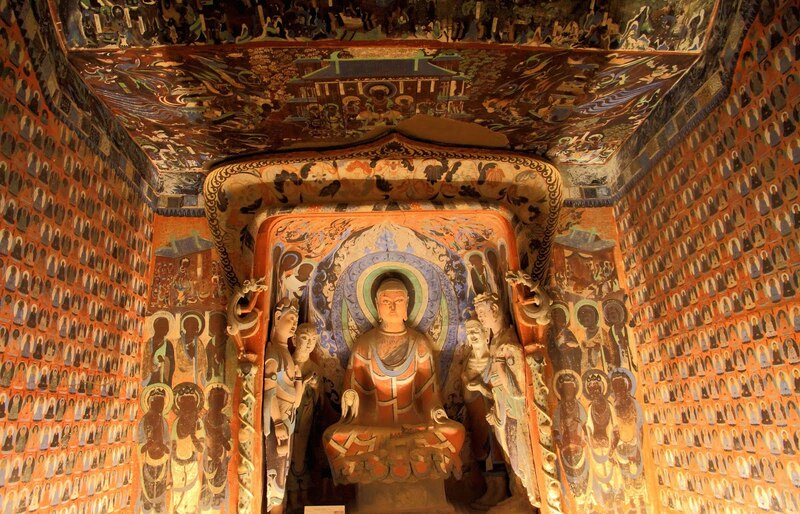 It's here in these caves or grottoes that one can see not only the artistic skill that spans over 1,000 years, making it a kind of library of art history of that time, but also how Buddhism was depicted and studied. 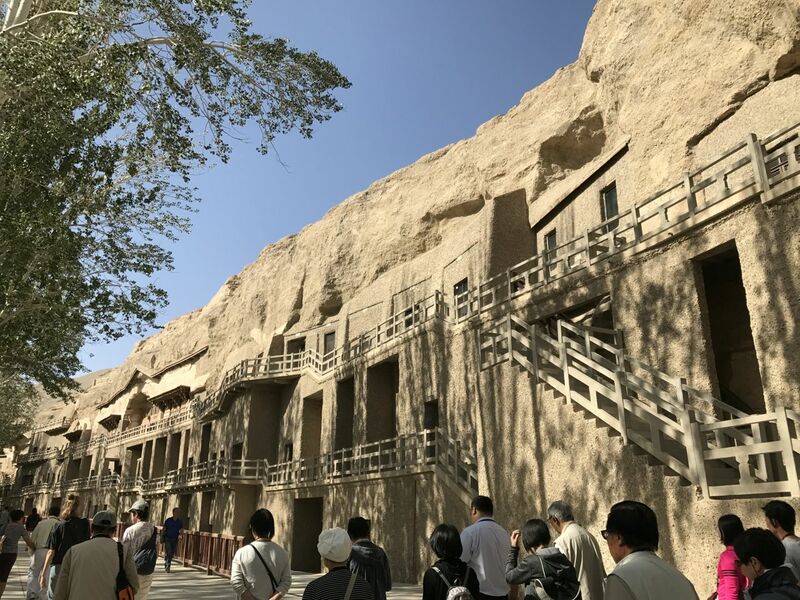 Some pilgrims paid artisans to decorate caves for them, and so it must have become a mini industry in the middle of the desert to demonstrate their devotion to Buddha. Apparently there were some 1,000 caves, but when they were abandoned, the desert sands took over them; there are 735 left, of which almost 500 are decorated. 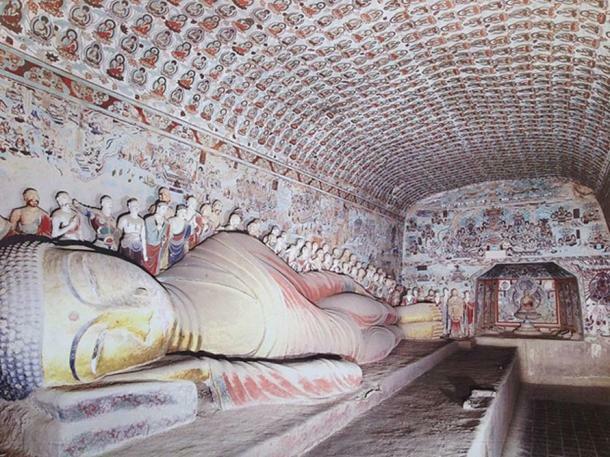 While most of the caves feature three Buddhas -- the present, past and future, along with musicians and dancers that seem weightless in the sky, there were also more down-to-earth portraits of wealthy patrons, such as the Cao family, featuring women in long robes and make-up. Others captured daily life, such as farming and the foods they ate. We only saw about seven caves and the ones we saw were not all in good condition. Some figures had black faces, but that's because the pink colour had oxidized over the decades and centuries. 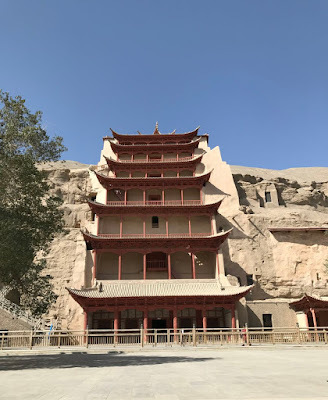 Some caves had glaringly empty spots where sculptures used to be and had been stolen, or the "eyes" of Buddhist disciples scratched out because they used to have gold on them. 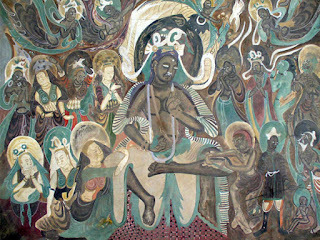 One cave had a giant Buddha lying on his side after death, his disciples mourning in grief, while another had Buddha standing up 75 feet tall. 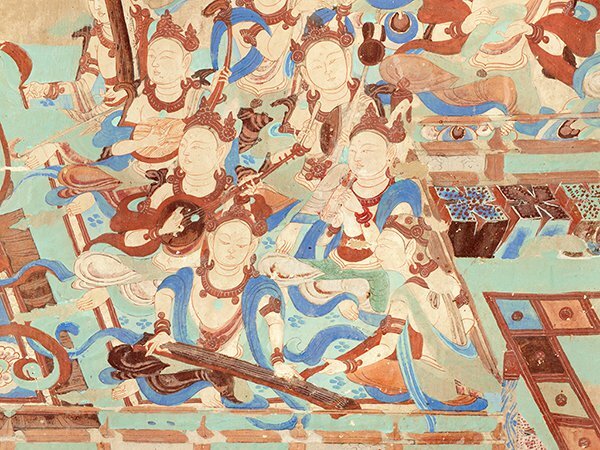 A reminder of foreign theft was shown in one cave that had stored 7,000 manuscripts including the Diamond Sutra that was published in 868AD and were gone, now in the British Library. The caves are individually locked with padlocks which our guide has to use a key to open each one and lock afterwards. We were lucky to come here just before the Golden Week rush, so there wasn't a massive crowd of people, and we came early in the morning too. We wished we could see more, and the prime examples of caves, but alas, our guanxi wasn't good enough. But just to have the experience of being in these caves and seeing the majesty of the art work was enough to satisfy our curiosity. Will we come back? Not sure, but at least we saw a slice of it. No wonder artists like Zhang Daqian came here to copy many of the murals, staying here for months at a time. I managed to see some of his works from his time there in August when there was an exhibition in Macau. I left Hong Kong in July 2001 after living here for seven years. And now almost nine years to the day I'm back to record my take on what's happening in the city and the region.